Thousand Hills Golf Resort is a perfect vacation destination in Branson that offers a variety of lodging options that include condo, log cabin and townhouse. Whether you love to stay in a log cabin in a secluded area or want to view a beautiful lake through a cozy lake condo or townhouse, Thousand Hills Golf Resort has got you covered. Lodging in Branson is a great way to see the beauty of nature, spectacular wildlife, picturesque Ozark mountains, and the pristine lakes. Your stay at any of the lodging properties at Thousand Hills will let you experience luxury and comfort that can’t easily be enjoyed in regular hotel accommodation. Located around the vicinity of the golf course, these great lodging places in Branson feature free wi-fi internet access, cable TV with HBO, and a DVD player. These lodging units are also equipped with modern appliances such as fridge, microwave oven, dishwasher, washer/dryer, pots and pans, and kitchen wares and utensils which are a great help to make your stay convenient and comfortable. While staying at any lodging unit at the resort, you can have the chance always to enjoy the resort’s activity center which offers board games, pool tables, arcade games, and a bunch of DVDs to borrow. The perfect location of these lodging units in Branson allows you to enjoy the panoramic view of the rustic wooded valleys and the spectacular golf course. Enjoying an awesome stay at Thousand Hills Golf Resort will not just be wonderful but a memorable one as you feel the excellent atmosphere in a calm environment that will make you forget busy city life. Whether you like to stay in a log cabin, a condo or a townhouse, you will find that any of these lodging places can accommodate big families or groups of any size. Your stay at any of the lodging units at Thousand Hills Golf Resort allows you to enjoy comfortably as each bedroom is furnished with king size bed and has a separate living room. Each of the lodging unit features a fire place, whirlpool tub, and a two-person rain shower. These lodging units also feature a sofa sleeper so that any extra guest can enjoy a comfortable stay. Guests staying at any of the lodging unit of Thousand Hills Golf Resort can have the opportunity to enjoy its seven indoor and outdoor swimming pools. The lodging units at the resort are just minutes away from Branson’s live entertainment shows and exciting attractions. Restaurants, theaters, and shopping venues are all minutes away from your accommodation. As Branson is home to about 45 theaters, you may want to watch world-class live entertainment show performed by the world famous entertainers or just watch your favorite movie. Live entertainment shows and a number of movie shows in theaters are sure to give you unforgettable vacation experience in Branson. 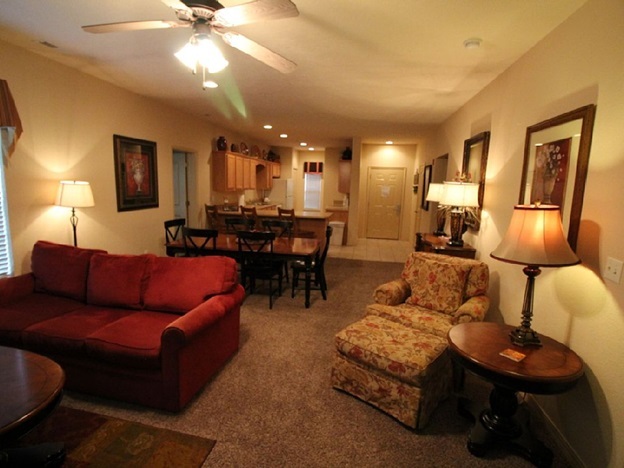 So, if you want to enjoy your vacation in Branson, stay at any of the lodging units of Thousand Hills Golf Resort as they all provide you a convenient and comfortable stay.